Nothing signifies Halloween like a glowing Jack o’Lantern with a unique pattern. In this tutorial we show you how to create a unique Halloween pumpkin using a laser. This has been replicated courtesy of our global premium partner Trotec Laser USA. Click here to be taken directly to the laser parameters. Buy a pumpkin from your local supermarket or from a farm shop. Try to find one that’s a good size with little visible damage/marks. The perfect pumpkin has a smooth surface and a uniform colouring. For a perfect engraving result, we’ve activated the “High Quality” option. Take a sharp knife and a spoon. You will also need 2 bowls – one for the seeds and the other one for pumpkin pulp. Wipe the inside of the pumpkin down with a kitchen sponge. 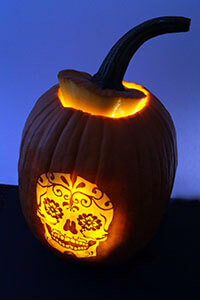 Place a candle or a LED-light inside the pumpkin and close the lid. Now your Jack o’ Lantern is ready for Halloween! Don’t thow the pumpkin pulp away – keep it and cook a delicious soup.